One of the best ways (for some moms) to decompress is with a good book. 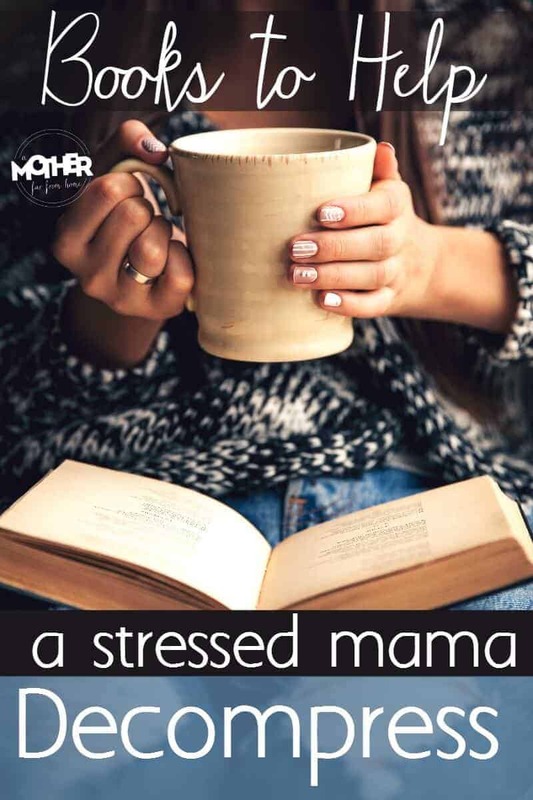 If you have tried natural ways to de-stress and are still a very tired mom, I hope this book list will help give you some reprieve. Posts contains affiliate links. I believe this is a very appropriate quote for moms…. When we’re stressed at the end of the night, one of the best thing we can do is read. I personally think it’s better than screentime because it can help lull your mind and prepare you for sleep. I love reading a good book until I’m drowsy then going to sleep. One of my favorite things to do is take a 48-hour mommy vacay with a thick book. This doesn’t happen as often as I’d like, but when I go I try to find books that are “can’t put down” and quick easy reads so I don’t bogged down and feel like I’m doing research. These are some books I’ve read, some as much as ten years ago, that were fast and enjoyable reads. Beach reads, if you will. Some are emotionally charged, but I’m purposefully avoiding tragedy laced books because those, quite simply, not going to help me decompress. They are going to increase my emotional stress level. And what we learned the other day is we need to create margin and rest in our emotions, not overload them. One thing I’ll say about Kate Morton’s books is this: if the characters told the flipping truth a whole lot of trouble would be avoided. Each book make me say to myself, “For pete’s sake, just be honest and stop being shady.” Not that people were evil, but there was a lot of hiding and secrecy with everyone thinking it was for the good of everyone else when, obviously, it wasn’t. That said, I couldn’t put them down. The Secret Keeper | This book was very fascinating to me. As with her other books, there is a lot of weaving from past to present. Wartime to present time. The Forgotten Garden | I read this recently and loved it. I stopped and started it a few times because the beginning was hard for me to get through. I hate anything that even remotely whiffs of kidnapping or child abandonment. Once I got past the first 50 pages I was hooked. It also went from past to present and read quickly and enjoyably. The House at Riverton | This was great if you love Downton Abbey, upstairs and downstairs type thing. This one drove me crazy and I couldn’t put it down. Again with the secrecy and “just tell the truth” type feeling, and yet it was really enthralling. Past to present again. The Distant Hours | This may be my favorite Morton book. It follows a young girl whose mother receives a letter, decades after it was sent. It takes place in England, which I love, and there’s a huge old house and a love story gone wrong with dementia thrown in there. The Lake House | This is Kate’s latest book and just as great as the ones before. I will say that there is something of child kidnapping in it which can be anxiety inducing for some, but I was able to push through and usually am not. Also, it’s her only book that I guessed the plot twist which I thought was cool and slightly annoying. I read this series about ten years ago. It’s young adult fiction and in the fantasy arena. It takes place on a seaside village with a young boy who goes on adventures. I’m not a sci-fi type person so this isn’t aliens and what not, but it is Christian fantasy. I’m not sure they are in new print, but you can buy it for as low as one or two pennies on Amazon. The Legend of the Firefish | The story revolves around Packer and the search for a Firefish, a mythical sea creature. Sounds a bit cray cray but the storytelling is rich and captivating from the opening scene. The Hand that Bears the Sword | This story focuses on Packer and Panna with the young man again setting sail. The author has won two Emmy awards as well here, which I didn’t realize. The Battle for Vast Dominion | This is the final book in the series. It’s the epic tale of good (Packer and His God) vs. evil (the Drammune). I enjoyed this and all the sailing and boat references. I loved the True Confessions of Charlotte Doyle as a child as well. These are period books, mostly all set in the backdrop of the British monarchy. A few dealing with the Tudor dynasty. I personally love British royalty books so these were great for me. They are full of history and the author herself is an established historian. I have a few more of her books I haven’t yet read, and will add them when I can give some feedback. The Queen’s Fool | This book was fast, interesting, and annoying read. I still read it very quickly and “couldn’t put it down” but I find myself rarely siding with the protagonist. Is that weird? Anyway, the story centers around a young girl who is “seer” or gets messages from the Holy Spirit as it relates to Queen Mary and Queen Elizabeth. The Red Queen | This book was set when the Lancasters and Yorks were fighting over the succession of the crown. It centers around a mother who is doing everything in her power to get her exiled son on the throne. It was crazy to me at times – the fight for the throne is just so brutal – but I enjoyed it. I love this author. She’s thoughtful and interesting with lots of plot twists in each book. Inspector Gamache series | Louise Penny writes a series about a homicide detective that is set outside of Montreal in Quebec. It’s not gruesome, lewd, and is full of interesting characters and information. They are easy addictive reads that do not give you nightmares. I’ve shared these before in my must read series post, but they warranted another share. I think if I was alone on a desert island (oh please hear me, Lord!) for a week I would tear through these at once. They are intriguing, full of history, thoughtful, but not too heavy you feel stressed. It really deals with a lot of simple and basic faith issues. A Voice in the Wind | The first book introduces and centers around Hadassah, a Jewish girl who goes into service (slavery?) for a wealthy Roman family. The girl she cares for is selfish, horrible, and unlikeable. Her older brother is…. the opposite. An Echo in the Darkness | (Fun fact, when I found this book on Amazon just now it says I bought it way back in 2006. Ha. Classics never get old). This book focuses more on Marcus, the older brother in the family Hadassah served. You are just as enthralled in the second book as the first, even though you worry you will. As Sure as the Dawn | This focuses on a former gladiator Aretes. He is maddening and interesting and the story is very interesting. Hadassah’s story also weaves through this as well, and as it nears the end you are so sad to see it stop. What are your favorite books or series you go back to time and time again? I like Jane Austen, so when I found Georgette Heyer’s romance novels, I was so impressed. They are (for the most part) not filled with angst or tragedy; there is humor in many of them, they are filled with rich period style British language, and they are great for lulling you to sleep at night because hey are just boring enough. Some people need thrillers and page turners, but some people do not need that. I am emotionally sensitive to a lot of things, and these books really give my mind a break and calm and amuse me. The language and sentence structure is complex, which I appreciate, but some may not. Also Georgette Heyer’s romances are not at all raunchy. The Grand Sophy is a good place to start.